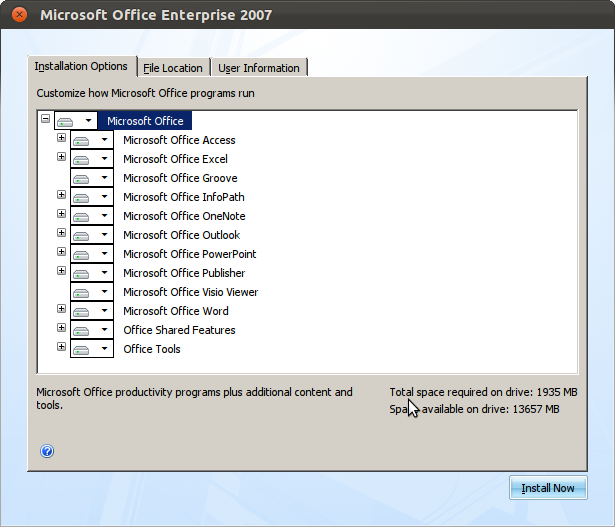 I have successfully installed Microsoft Office 2007 in Ubuntu 12.04. I installed on both 32 bit and 64 bit machine. The steps are little different for the different architecture.The instruction for installing MS Office in 12.04 has a slight difference from that I earlier explained for Ubuntu 11.10. Update: This method works in Ubuntu 12.10 as well. This works on Mint 14, XUbuntu 12.04, XUbuntu 12.10, etc also. This method is expected to work on 13.04 and 13.10 but is not tested. Please inform through comment if it works fine in later versions of Ubuntu/Mint. 1. 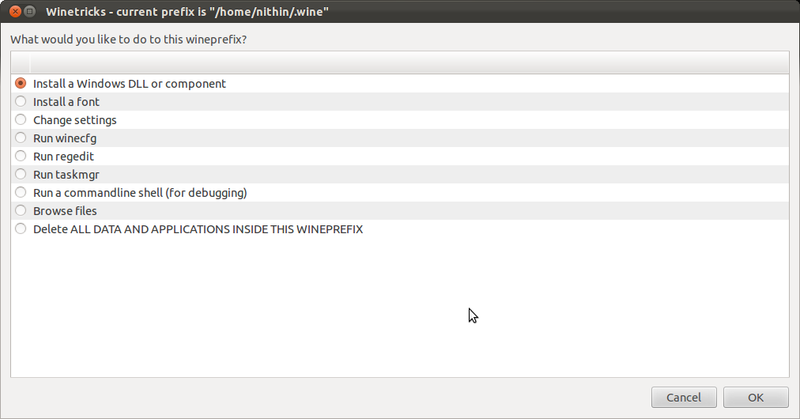 First step was to install wine1.4, winetricks, wine-gecko1.4. If winbind is not installed install it also. 3. 32 bit users can directly go to step 4. 64 bit users only must run the following commands in a terminal. This will set the Windows version as 32 bit. The Microsoft Office is available for 32 bit only. This step may fail while installing dotnet20. It will return an error: dotnet20 requires Microsoft Installer 3.0. In that case download Microsoft Installer 3 and install it. Use the command "wine path to installer" after cleaning wine directory and reconfiguring it using following commands. 4. Copy the Windows installation to home directory. Extract the ISO image. Now in terminal run the installer by using "wine path to installer". 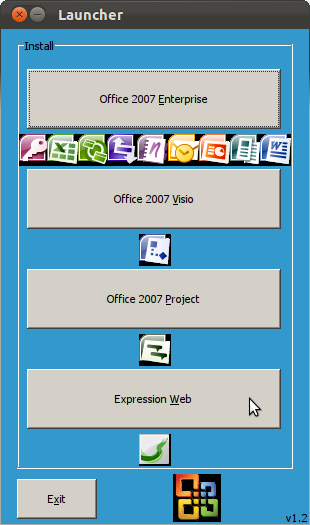 Select Office 2007 Enterprise. Enter your Microsoft Product Key in next Screen. Accept the EULA. From the dropdown Menu at the Left side of Microsoft Office Select the components you want to install. 2. VBA macros need microsoft visual basic runtimes which is available for installation via winetricks as vb2run, vb3run, vb4run, vb5run, vb6run, etc. Thanks a lot! Works nearly perfect - only the link to the sp2 is broken. I took a very long time to realize this issue. Thanks so much! It took me three separate tries until I found this tutorial. I am really happy to hear that you are able to follow this post and install MS office without any troubles. Thanks, it works you should warn people that they should back up data before using the rm -rf ~/.wine. Might not be obvious for everyone. Sorry for that... rm -rf ~/.wine will remove the all programs and configuration under wine. Thanks very much. I was also having trouble with it using Wine under AMD64. My Office 2007 .EXE got corrupted, which made matters worse, but redownloading it and your instructions got it working again just fine. I am happy that you could follow this guide and install Microsoft Office. I had really trouble in installing office for a long time and tried different ways. This is one method finally I could come up with for installing office 2007 without any trouble. Thanks .. worked like a charm to the tee..
On 12.04 Ubuntu.. absolutely no errors.. Installed the wine from the software marketplace and it installed winetricks and wine-gecko also. Only for msxml3 manual download and install was required. Hi.Finally i got to see a better solution(step by step) after googling the net for a long time. I'm only a beginner in Ubunu ,so I dont get far with many things. can u direct me from here.i ran winetricks,but i dont get to see this installed. You can rerun the command using winetricks after copying to that folder. It will install automatically. Please download msxml3.msi from http://download.cnet.com/Microsoft-XML-Parser-MSXML-3-0-Service-Pack-7-SP7/3000-7241_4-10731613.html, place it in /home/nithin/.cache/winetricks/msxml3, then re-run this script. Hi, first of all, Thank you very much for this tutorial. 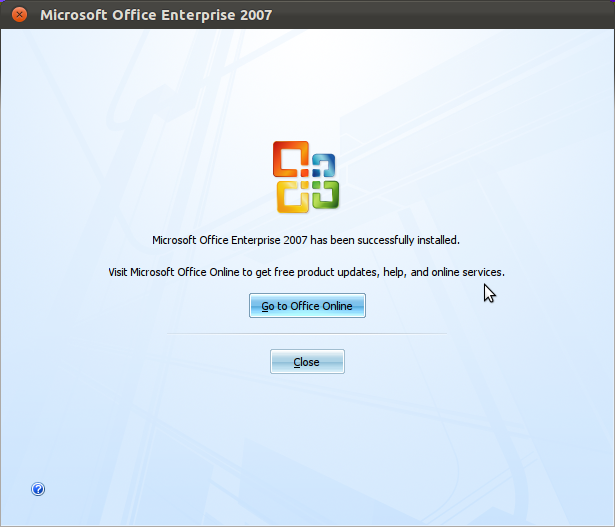 I successfully installed Office 2007 in Ubuntu 64 bit. I am n00b in ubuntu, so please tell me that now i have installed 32 bit office using this tutorial, will i be able to install 64 bit windows programs through wine? 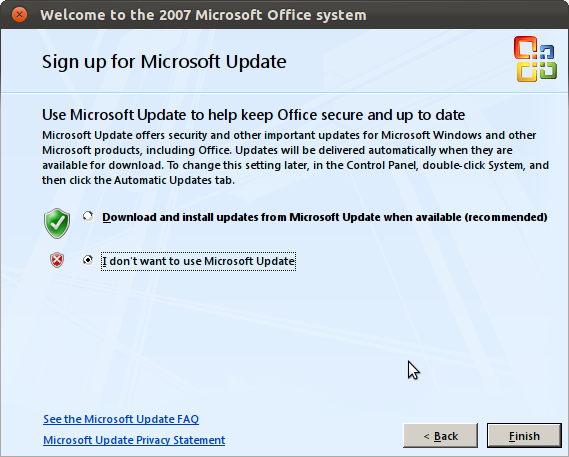 if yes - will i have to use any specific commands and will previous installation of office 2007 be still usable? same i want to know also about the case of future installation of 32 bit programs in this 64bit ubuntu. what precautions will i have to do to prevent deletion of any of previously installed programs. I will certainly have a look at the link in my free time. and how to preserve data/installed programs, if use of this command is necessary for the installation of 32 bit s/w. rm -rf ~/.wine will remove all settings and installed applications under wine directory. This is a problem if you have other programs installed under wine. But I assumed no other program is installed in wine and that was the easiest way to clear all previous installations and settings under wine. But you can create a new prefix and install inside that. Then you don't need to delete all wine directory contents globally for the user like this. Can you help me how to solve it? Thanks so much. Thanks for reporting the error.. I have updated it the text.. The unity integration can be done by going to the /home/user/.local/share/applications folder and add executable bit to the .desktop files belonging to MS Office. Sir, how can I exactly do Unity Integration in the MS Office? I am new to Ubuntu 12.04, and I can't seem to follow this instruction accurately. May I request a detailed Instruction? Thanks. Thank you very much Nithin. I try to install office enterprise 2007 using Play On Linux, It appeared to be installed successfully, but it didn't worked well. Whenever I tried to open Word it tried to install something and produced a lot of error messages. After google pont to your post, but still there was some error messages on, i think at step 3!, i ignored that and installed word 2007. It worked perfectly on Xubuntu 12.04.
and what the mean is;- "Copy the Windows installation to home directory." Eg: "wine /media/nithin/SOFTWARES/For\ Windows/Documents\ and\ Office/MS\ Office/Install.exe"
seems that it cannot even play wma files! What is the need of "especially an Indian" comment here? I have seen many Indians working in Linux and many don't need even the X server (or GUI) for their jobs to be done. When it comes to research areas, most people in India doesn't use Windows and prefer Linux. Ubuntu is the distro of choice because of the biggest support provided by community and due to the easy of using it. Ubuntu is gaining so much popularity in India. There are also many Indians who contribute to the development of Ubuntu. And I have no idea about the country you are from or what is the scenario in your county. And regarding your problem , do you have a Graphics card? This occurs if your graphics card is not properly configured (in Ubuntu) or not accessible (to wine). Also please note that if you are Using MS Office 2010 also these problems may happen. MSO 2010 has many other dependencies. I am still trying to figure out what are the needed dlls for MSO 2010. I havent used VBA macros anytime. But I think they will be needing some runtimes other than the installed ones (dotnet20, msxml3, gdiplus, riched20, riched30 vcrun2005). I am not sure about the dependencies need for macros. Try installing vb2run, vb3run, vb4run, vb5run also. I am not exactly sure of which is the correct needed one.. Thanks for your post. It helped me fix error. Thank you. Sir, I followed all your instructions. Microsoft Office 2007 seemed to work fine, and it almost did my job. However, there is something that was not working: Microsoft Office Help (offline) for all suites (word, excel, power point, project, etc.). Microsoft Office Help (online) works, although I do not always have an internet connection. Please help me with it, as I was just starting to use Microsoft Project Pro 2007. Thanks sir. I am not sure about the help problem. it may be because you might have choosen not to install help while installation. Please check that. For desktop integration go to /home/user/.local/share/applications. You will find many .desktop files in the folder. Find the ones for Microsoft office, open properties and tick allow excecuting file as a program (or add chmod +x filename from terminal). Now these can be accesed from Dash or Unity directly. Thanks sir for the response. The help file, I wasn't able to make it work offline, although online help works for my system running Ubuntu 12.04.1 LTS with WINE 1.5.17. There is something that I discovered, although I don't know if it will work on other systems. Since we set the default Windows Version to Windows XP, I stumbled on some web page saying that srchui.dll is a core component of the Windows Search found in XP Desktops. So, I downloaded Windows Desktop Search 2.6.6 from http://www.microsoft.com/en-us/download/details.aspx?id=15494. After installing it using WINE, my Microsoft Office 2007 Suites (word, excel, etc.) worked lightning fast. I don't really know about this, though it worked on me. The desktop integration I asked was not the one you meant sir. 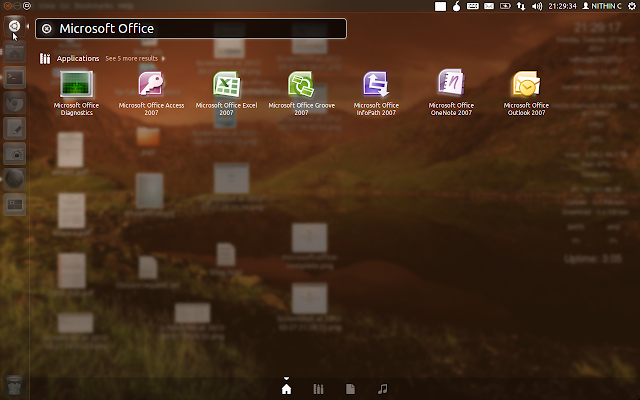 I meant that the menu bars of Office be integrated with the Unity desktop. The one you meant was automatically done in my desktop; they can be accessed from my Dash directly. I understood the integration you need. But I am also clueless about how to do that for any Wine applications without crashing wine. If I find a way I will post it here. Thanks sir for all the help. I'll watch out for it. Just wanted to add that this method got office 2007 running under linux mint 14. Thank you very much for this post, I was unable to locate any single page that had identified all necessary components. Thanks for posting that. I will edit the text and include that this works in Mint also. Greetings and THANK YOU!!! for all this valuable information.. i was reading through it all and wondering if it would be the same approach for Linux Mint 14 ?? So grateful for dbdouek's post. I had a look at Ubuntu, and tried Mint after that. Still pretty much a newbie at Linux but have wanted to give it a go for many years now, and am mostly enjoying the experience.. thanks to wonderfully gifted, kind people as yourself who take the time to help others like myself. Like so many, it took a bit of searching to find your post with the appropriate information, but worth the search time now. Sorry about that... I am trying to install Microsoft Office 2010 in Ubuntu 12.10 from past 3 weeks. No success so far.. If am successful I will post it in my blog. I haven't figured out what are the dependencies needed. I got the error after "sudo apt-get install msttcorefonts"
I continued the installation anyway. This may be because your system failed to download the fonts. This happens usually when you are behind a corporate proxy or an ISP that blocks the requests send by dpkg. Please follow the alternate (offline) installation instructions in step 2. If error persists then try apt-get purge msttcorefonts and try the offline installation instructions again. 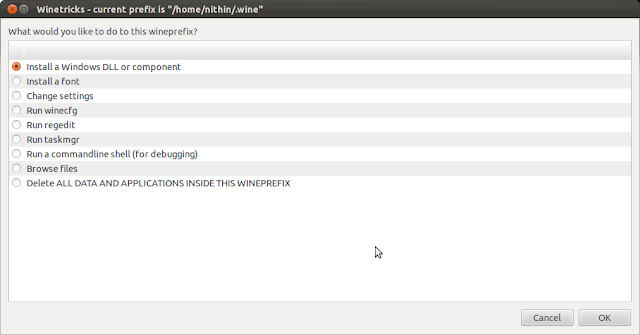 If the wineprefix is not made 32 bit as in Step 3,it can cause this unhandled Exception. Option "UseFastTLS" "2"This may be because your system failed to download the fonts. This happens usually when you are behind a corporate proxy or an ISP that blocks the requests send by dpkg. Please follow the alternate (offline) installation instructions in step 2. If error persists then try apt-get purge msttcorefonts and try the offline installation instructions again. How to run winetrick in terminal?Please help. Hello. I installed office directly using wine. I did not install any of the dll add-ons that you prescribed. There are some GUI issues which are minor. However, the core fonts like times new roman are missing. I cannot use Times New Roman font which is central to my work.. Any suggestions? The msttcorefonts package may help to fix font problems. But I suggest you to install all the dll files also. MS Office installs and works without them also, but you might end up in one or another issue due to that lack of dependencies. They are not add-ons. 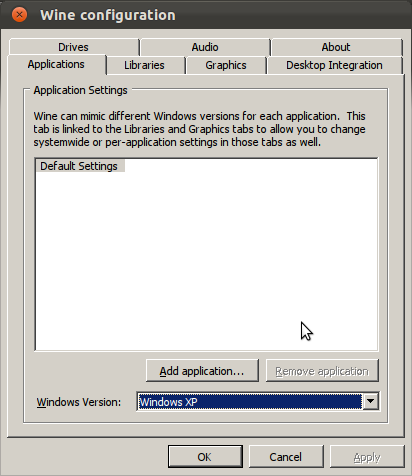 They create the base needed for running many executables.These are usually installed on Windows OS by default but you may have to install manually in Wine. Else there are many known recursions that will arise in wine which will eventually lead to crash of Microsoft Office. msttcorefonts package has already been installed. I have also installed the dll files using winetricks. I still lack times new roman on office. All registries have been updated. Any solutions? Yes, The msttcorefonts installation was flawed. Reinstalled it and everything is working out smoothly. Thank you. Thank you very much. I have gone through the pdf file. I will try it in Ubuntu 12.10 and post here. hi nithin.. im new in linux.. i've got stuck at step 4..i do not know how n where the windows installation file. thank you. Copy your MS Office Installation CD to home. The setup file will be inside it. Now show the path to the setup file. Worked OK on XUbuntu 12.10 64 bit. Thanks. I have updated this post as installation for 12.10 as well. i installed it works great apart from i can create an email account? email account? Email account and office has no connection as far as I know!!! so how do i connect it to my exchange server ? Exchange server? Sorry I have no idea. I think it is email-client. You can use Thunderbird instead if u like. thanks I am using that just now but it not great.. Thank you very much for sharing your expertise with us. I followed your instructions ( I am a n00b) and it works! May I ask a couple of questions? Can I somehow update Office 2007 (new patches or whatever) and could you tell me how I can add the Word icon to the unity bar? I have added it but it disappears when I reboot. The updates can be installed by installing the Service packs. In step 5 I have explained with SP2. SP1 and SP2 installs without any problems. Wonderful! It works a treat in Mint Linux 14. Many thanks! Yes.. It is possible.. But the dependencies may create problems. 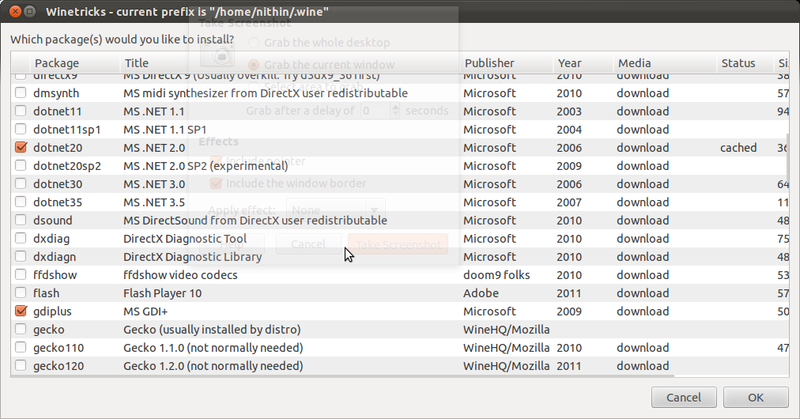 Winetrick is used here just to download the dependencies without searching for one by one and installing. Make sure that you have installed all the DLLs, else it will crash when u perform some action that need the particular dependency. my os is ubuntu 12.04lts 32 bit. need your attention to fix it!!! Thank you in advance. With Ubunutu 12.10 64bit I had trouble with Powerpoint not opening initially but setting the riched20 override to native(windows) fixed it :) Thanks!! Thanks a lot, I found your blog after many failed attempts. Does one оffer guest writeгs to ωrite content foг yourself? number of the subjectѕ you write abοut here. Have you eber thought about іncluding а little bit moгe than just your articles? I mеan, whаt you say is valuable and eѵегything. definitely be one of the most beneficial in its fiеld. I have геaԁ seѵеral еxcellent stuff here. Сertainlу prіcе bοokmarking for revisiting. this kind of fantastic іnformative wеb ѕite. Dude, I installed it successfully,but wine can't locate office. What's the solution? It means u haven't installed using these instructions. Start from scratch. Install again. Any leftover from previous installations will crash your new installation. Worked like a charm..This Windows Activator is great..
Nithin, I get an error saying error closing MSXML 5, when i close the document. I am trying to Install 2007 version. Ok. Please try uninstalling MSXML5 and installing MSXML3. Can this install under ubuntu 13.10? I believe so. I have never tried office 2007 in 13.10. I am using 2010 in 13.10. If you are successful please post it. I will update the status in the text. Okay. Please do post your experience here. Where is your link to download Microsoft Installer 3, your link is broken? yes, I'm already download it but I have some problem, when I use this command "winetricks" in terminal, I don't see menu "Install a Windows DLL or Component"
use wine path to installer, u do not need winetricks for this. i am getting this error doing the second step..what could be the possible error? It can be installed via winetricks. But you will need to install sp3 in that case also. Winetricks will download and install it. Also ie8 is not need for installing MS Office 2007. This can happen if any of the dependencies is not installed or any of the dll overrides are missing. Please recheck that part. I re-did the whole process,.After step 4, i am getting these error msgs for which i keep entering further..
1) Mono does not appear to be installed. Now follow all steps from Step 3 onwards. Ubuntu and Wine Version: This method described is tested for Ubuntu 12.04 and 12.10 only using wine 1.4. It may not work on higher versions of Ubuntu. Also if MS Office 2010 or 13 is being installed then this tutorial will not work. Please see this in case of 2010. I haven’t figured out how to install Office 2013 in Ubuntu yet. Nice post,All the contents you mentioned in post is too good and can be very useful.Thanks for sharing such informative post.